After a drought of over 3 months, we have again received a new batch of spy shots of the new BMW 4 Series convertible. The last time we saw it, it was being hauled by a car hauler, which made it hard for us to make out a lot of details of the car. This time around, the car was seen on the road out in the open – the roof was still closed, as expected. This was seen earlier and now it has been confirmed by the new spy shots that the new BMW 4 Series convertible will feature a classic fabric roof instead of the folding hardtop. The fabric roof has its own set of advantages, it is loved for its simplicity and lighter weight. The 2014 F33 model 4 Series featured the hardtop solution which had compromised the luggage space a lot more than the new fabric top alternative would. Thankfully, whoever was on the spot capturing images of the car also was able to grab an image of the interior too. With the dashboard being covered heavily to camouflage the looks, it is almost impossible to tell if the interior has borrowed design from the 3 Series’ interior or if it is more similar to the interior of the new Toyota Supra as we know that it shares BMW’s drivetrain. One thing that you can spot in the interior is the rooftop control panel next to the parking brake switch. The camouflage on the car is still pretty heavy and not a lot of details can be made out of this batch of spy shots. 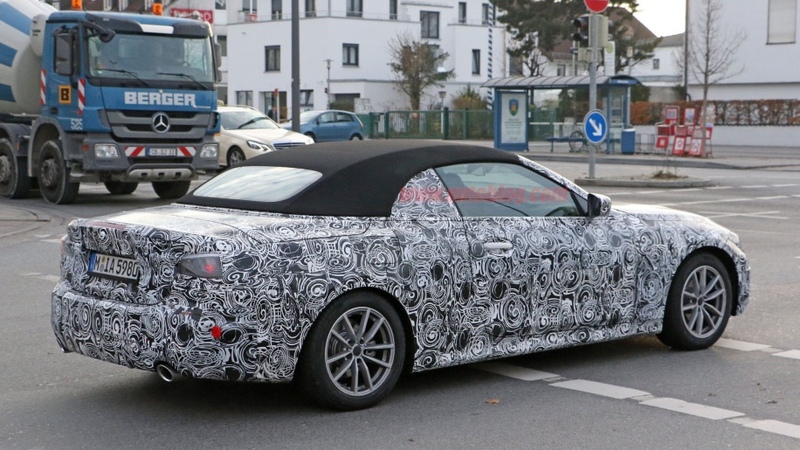 However, the overall essence of the prototype model seen in these spy images seems to be that the new BMW 4 Series convertible will borrow a lot of its design from Z4’s sketchbook and the decorative material will be more oriented towards the 3 Series’ design. This can be confirmed by the honeycomb pattern that is clearly visible in the kidney griller at the front of the car. As for the performance, we know that the G23 series cars that will debut in 2020 will be based on the CLAR modular platform and they will probably be powered by the two popular four- and six-cylinder engine options. We can also expect a plug-in hybrid version to arrive in 2020. However, the prototype is probably not a plug-in hybrid prototype as it has twin exhaust pipes. Some sort of urban camouflage to conceal the prototype nature of the car from car journalists' and enthusiasts' prying eyes? Well, whatever it is; it's NOT working! Look at me, I'm a prototype! Cheap yet effective publicity! We wouldn't be here otherwise, now would we?